In 2008, the world used about 474 exajoules, or 132,000 TeraWatt hours worth of energy from all sources. The potential for global solar energy has been estimated to be about 3 times that, at 1600 exajoules (444,000 TeraWatt Hours). How much solar energy is used in the world? 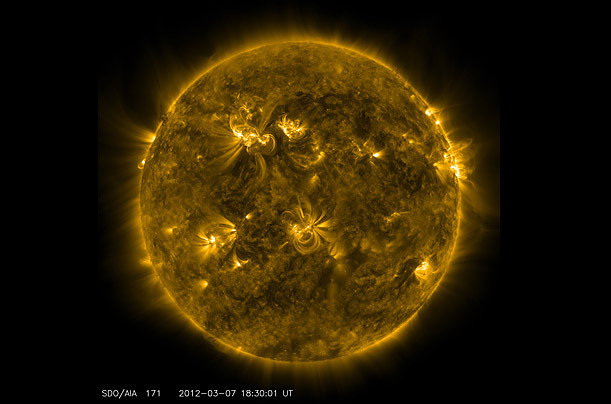 Overall, the sun emits about 7,000 times more energy than is required for human consumption. Presently the total amount of solar energy consumed for human use is less than 1% of our entire energy requirements. This means that an incredible amount of energy is still waiting to be captured. Fossil fuels are also solar energy derivatives. But the problem is this energy is neither reusable nor clean. The annual global electricity requirement for human civilization is estimated at around 17,000 tera-watt-hours. This is roughly the equivalent of an an hour of bright uninterrupted sunshine striking the earth’s surface. World-wide, there are about 4 billion hectares of open, unused land. 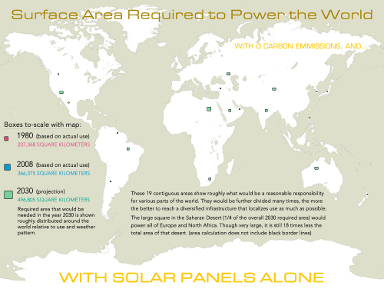 Though not all of it can be used for solar power generation, even a fraction would make a huge difference. Using just 1% of this area would result in the generation of several times more electricity than is produced by sources like nuclear power and fossil fuels. It has actually been estimated that just 366,375 square kilometers of land would power the entire world with solar energy (see graphic above). To increase the contribution of solar power to world energy consumption, massive infrastructure overhaul and policy changes are required. While most countries promote solar power use, a huge chunk of usable solar energy is still being wasted due to lack of infrastructure and technology. Technologists and industrialist are working overtime to raise the total percentage of solar power usage to help dampen the effects of the impending energy crisis.